Hi there! Happy Mother's Day to all you mothers out there, it's a beautiful day here. 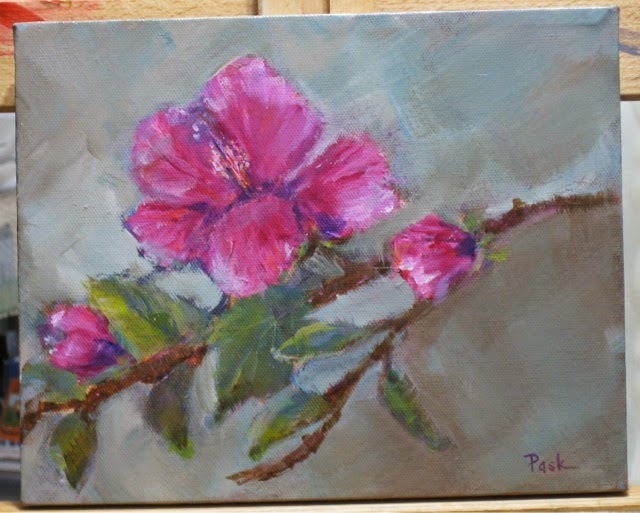 This pink Hibiscus was painted a few weeks ago, it is acrylic on a 8" x 10" stretched canvas. Sorry I didn't get it squared up in my photo so I couldn't crop it close enough. I have a question, if you follow my blog or have your email address entered in my Google Group box do you receive my posts by email? I assumed my posts were going out by email but not sure that is happening. Fellow bloggers, do you have that option on your blog? If so what do you use to make that happen? I am planning to give away a small painting soon but I want the benefit of knowing people are signing up to receive my posts. Thanks in advance for any help you might offer. I love the color of this flower, Barbara...A beautiful Hibiscus..!! Your latest posts goes into my google mail...I wish I knew how to do it ..I would do the same thing..lol. I am such a dinosaur and get angry at myself for not figuring it out! Happy Mother's Day, my friend!!! Oh thank you so much Hilda! Thanks for responding to my question about my posts, sometimes I feel like no one sees them.